Electroplate, Electronics Mechanic, Fitter, Machinist, Instrument Mechanic, Mechanic Machine Tool Maintenance (MMTM), Painter (General), Pattern Maker, R & A/C Mechanic, Welder, Carpenter, Foundry man, Forger & Heat Treater, Mechanic, and Sheet Metal Worker for period of 1 year or 2 years of 2019 - 2020 or 2019 - 2021 (Pipe Fitter Trade Apprentices) batches. As per notification, total posts are 290. Application mode is online. Last date to apply online is 05th December, 2018. Last date to send print out of application forms to "The Officer in Charge, Naval Dockyard Apprentices School, VM Naval Base S.O., P.O., Visakhapatnam, PIN 530 014, Andhra Pradesh (AP)" is 12th December, 2018. 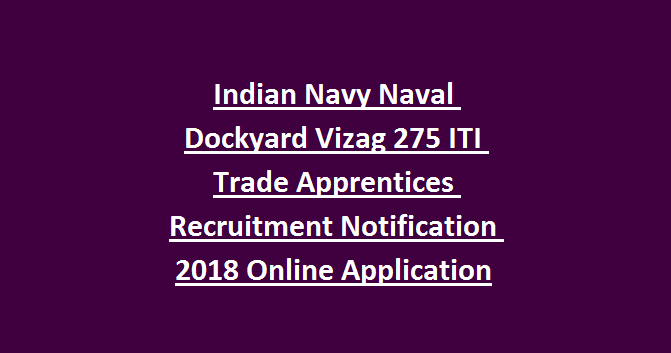 All details of Indian Navy Naval Dockyard Vizag 275 ITI Trade Apprentices Recruitment Notification 2017 Online Application mentioned below. As per notification of Naval Dockyard Apprentices School, DAS Vizag (Indian Navy), total Trade Apprentices are 275. SSC or Matriculation or Std Xth passed with 50% of aggregate marks and ITI (NCVT) certificate in relevant trades. Age Limit for candidates must in between 01st April 1998 to 01st April 2005 for General category candidates; 01st April 1993 to 01st April 2005 for SC / ST category candidates. It will be through written test, Medical test followed by Interview. Written test is an objective type based on General Science, Mathematics and General Knowledge. 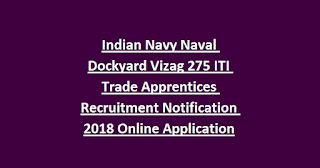 Candidates may log on to official website of Naval Dockyard Apprentices School, DAS Vizag (Indian Navy) i.e. www.apprenticeship.gov.in and apply online before 05th December, 2018. Take print out of online application and send to below address before 12th December, 2015.